NewsOn6.com reports that much of Oklahoma's wheat crop damaged. 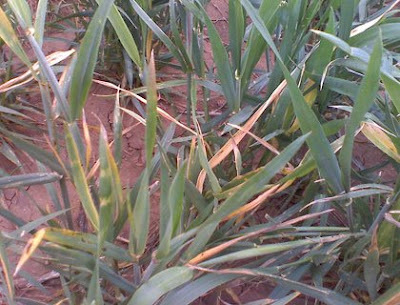 The Oklahoma Wheat Commission reports the majority of the state's crop is damaged. OKLAHOMA CITY, OK -- Oklahoma wheat producers are beginning to see the effects from a hard freeze earlier this month. Oklahoma Wheat Commission Executive Director Mike Schulte said some fields suffered damage of up to 90 percent. While consumers likely won't see any price jumps at the grocery store in the short term, Schulte said they will likely see price changes a few months from now. Michael Peters of Okarche has been a wheat producer for 20 years. He said he's never seen his wheat crop look as bad as this year's crop. "That's basically going to be zeroed out it's basically not going to make any grain at all," wheat producer Michael Peters said. Peters estimates over 75 percent of his crop is damaged. He said he's lucky to have insurance but many wheat producers do not. "You're looking at 60 percent of people who don't have insurance," Peters said. "It's going to be tough on them." Schulte has spent the last few days examining damaged wheat. "Here in central Oklahoma, King Fisher, we've had about 60 to 90 percent damage," Schulte said. Schulte believes about 40 percent of producers don't have insurance to help cover their losses, adding up to hundreds of thousands of dollars. Peters knows the cost of carrying insurance is worth it in the long run. Each acre of wheat has about $200 invested in it this season. The high cost is blamed on high fuel costs from the summer and big fertilizer costs of the fall. Most wheat producers have at least 1500 acres. The Oklahoma Wheat Commission reports that the majority of the state's crop is damaged. There is still a good chance in the Northern section, but that will depend on the weather. The crop there needs cool moisture. My reaction: Last week, I wrote about a hard freeze damaging wheat crops in southern plains. Now we have confirmation of the damage. 1) The Oklahoma Wheat Commission reports that the majority of the state's crop is damaged. 2) Some fields suffered damage of up to 90 percent. 3) 40 percent of producers don't have insurance to help cover their losses, which will add up to hundreds of thousands of dollars. Conclusion: Oklahoma freeze damage should start moving wheat prices higher. Once confirmation of the damage caused to wheat crop by torrential rains in India, wheat prices should surge. That will silence much of the today's talk of deflation. I wonder at what percentage it doesn't pay enough to have the combines come in and harvest it? I saw that alternet.org article. I am surprise the farmers from India committed suicide. Looks like The United States is affecting other countries due to our economic depression and self-indulgence. Don't get rushed, in some places of India there has been a steady rate of farm suicides of over 4,000 a year, and for whole India suicides total over 200,000 in the last dedade.